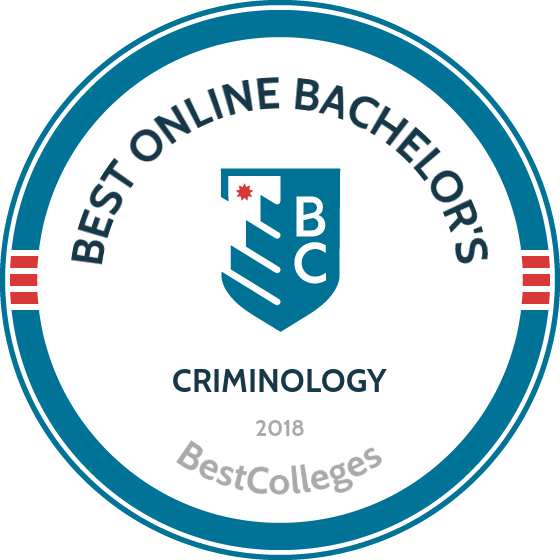 What are the Best Online Bachelor's in Criminology Programs? What Will I Learn in an Online Bachelor's in Criminology? Understanding criminal behavior is central to the operation of a modern criminal justice system. As a student earning a bachelor's in criminology, you'll gain insight into the mind of a criminal from a variety of social science perspectives. These perspectives, in turn, inform how crime is managed and prevented. By studying criminology, you'll also gain access to variety of career options in law enforcement, criminal courts, and corrections. According to the U.S. Bureau of Labor Statistics, overall job prospects for law enforcement officials are good, specifically for individuals with bachelor's degrees. The following page will explore what to expect from an online bachelor's in criminology program, including degree specializations, interesting coursework, and career prospects. What Jobs Can I Get With My Bachelor's In Criminology? A bachelor's in criminology is suitable for entry-level criminologist roles. Criminologists analyze statistical data in order to study the origins of different criminal behaviors. Those who have a bachelor's in criminology and extensive law enforcement experience may also qualify for leadership positions, such as deputy chiefs or police chiefs. What Skills Will A Bachelor's In Criminology Equip Me With? Criminology degrees demonstrate how to collect, organize, and interpret different kinds of statistical data related to crime and criminal behavior. Many programs have lab components where students gain hands-on experience working with different data collection tools and materials. Most criminology degrees also cover social science topics such as criminal justice and law, psychology, and sociology. Will An Online Criminology Program Work With My Schedule? Some online criminology bachelor's degrees follow a synchronous schedule that mirrors the format of brick-and-mortar programs, including weekly assignments. However, many programs are asynchronous, meaning students complete required coursework at their own pace. Asynchronous programs are ideal for students with jobs, childcare duties, and other commitments that may conflict with a standard college schedule. USF offers a fully online bachelor's in criminology degree through the school's College of Behavioral and Human Sciences. This 120-credit online degree prepares students for further work and training within the criminal justice systems in urban settings, whether it be in the public, private, or government sectors. The curriculum includes courses that provide students with a solid foundation in the theory, methodology, and issues at play in law enforcement, detention, the judicial system, corrections, and probation and parole. They must also complete elective courses on subjects like forensic psychology, criminal behavior, and domestic violence. This program can be completed in two years of full-time study. Transfer applicants must have an associate degree with a minimum GPA of 2.0 and completed two college-level foreign language courses to be considered. USF is accredited by the Southern Association of Colleges and Schools Commission on Colleges. UF is a public research university that was founded in 1906 in Gainesville, Florida. The school offers an online bachelor’s in criminology through the College of Liberal Arts and Sciences. This 120-credit program emphasizes the complex relationships between crime and society and provides students with an informed perspective on the broader societal, historical, and psychological factors at play in the criminal justice system. Graduates are prepared to continue their education in law school or with professional training. They may also choose to pursue a career in the public, private, or government sectors. Applicants must have a minimum high school GPA of 2.5 and have completed an introduction to statistics course, as well as nine additional credits of foundational coursework to be considered. The nine credits of foundational coursework can be in criminal justice and law or can be substituted with equivalent courses ranging from sociology to cultural anthropology. UF is accredited by the Southern Association of Colleges and Schools Commission on Colleges. FSU is a public university that was founded in 1851 in Tallahassee, Florida. The school offers an online bachelor’s in criminology that can be completed on a part-time basis. Graduates are prepared to pursue careers in victim advocacy, crime intelligence analysis, and social services case management. They can also continue their education in law school or by pursuing a graduate degree in a similar subject. This 120-credit online bachelor’s in criminology program can be completed in just two years. All online students pay the same tuition rate, regardless of residency. Independent living waivers, state employee tuition waivers, and the Florida prepaid college plan cannot be used with criminology undergraduate online courses. Students can double-major as long as their second major is also online. FSU is accredited by the Southern Association of Colleges and Schools Commission on Colleges. UNO is a public university that was founded in 1908 as a faith-based, non-sectarian Christian private school, and was incorporated into the University of Nebraska System in 1968. The school offers an online bachelor's of science in criminology and criminal justice program that is ideal for working students and adult learners. UNO’s 120-credit online bachelor's of criminology and criminal justice curriculum is organized into two main components: PCCJ (pre-criminology and criminal justice) and CRCJ (upper division criminology and criminal justice). Students are required to finish PCCJ requirements with a “C-” grade or higher in all courses relating to criminology and criminal justice and hold a minimum GPA of 2.5 before applying to the CRCJ program. Students that have been accepted into CRCJ can then enroll in the remaining required courses. UNO is accredited by the Higher Learning Commission. Ball State is one of the best public universities in the Midwest and is highly regarded for its mission that emphasizes community engagement. The school offers an online bachelor’s in criminology program that is ideal for working students and distance learners who are interested in the many facets of the modern criminal justice system. This program teaches students the communication and interpersonal skills needed to succeed in a career in law enforcement at the local, state, and federal levels. Ball State's 120-credit online degree is unique for the amount of flexibility it provides students in designing their own curriculum. With permission from an academic adviser, students can pursue a concentration in policing, courts, victimology, corrections, or special populations. This online bachelor's in criminology program has a reduced amount of required coursework, allowing students to choose enroll in even more electives. Applicants must have a minimum GPA of 2.0 to be considered. Ball State is accredited by the Higher Learning Commission. Regis is a private Christian university that was founded in 1877 in Denver, Colorado. The school offers an online bachelor's of science in criminology program that emphasizes the critical analysis of the social, political, and environmental factors behind criminal behavior. This 128-credit curriculum includes courses that go beyond the general causes and features of crime to focus on its many specific facets, such as juvenile crime, violence in the workplace, and terrorism. Graduates are prepared to pursue careers in a variety of industries and federal agencies where they can promote societal change and eliminate the root causes of criminal behavior. Faculty members are practitioners and researchers with real world experience, allowing them to pull on these experiences to provide students with insights that aren't found in a textbook. Regis is accredited by the Higher Learning Commission. NAU offers a number of distance learning programs, including a fully online online bachelor's of applied science in justice studies. This program is offered through the College of Social and Behavioral Sciences and is ideal for working students who want to earn a cheap criminal justice degree. Students may choose a concentration in either criminal justice administration or intelligence. Classes are offered on-campus, entirely online, and in a hybrid format. Students must maintain a minimum GPA of 2.0 in all major coursework throughout the program to graduate. NAU’s online bachelor's of applied science in justice studies curriculum includes coursework that prepares students to succeed as criminal justice practitioners and leaders, as well as enhancing their future career opportunities in fields such as intelligence and law enforcement. Applicants must have a minimum GPA of 2.0 to be considered. NAU is accredited by the Higher Learning Commission. A-State offers a fully online bachelor's of arts in criminology program that prepares students for a variety of entry-level careers in the field or for further studies in criminology, criminal justice, sociology, public health, public administration, or psychology. This program offers students a deeper understanding of the social contexts of crime, especially with regard to the intersection of racial, social, and gender identities. The 120-credit bachelor's in criminology provides students with a solid foundation of coursework on the many facets of the criminal justice system, social research, and law enforcement's role in society. Students must complete elective coursework on topics such as juvenile delinquency, drug use and abuse, and collective behavior. A-State allows online students to pair their BA in criminology with either a BA in communication studies, political science, or sociology as a double major. Applicants must have a minimum GPA of 2.0 to be considered. A-State is accredited by the Higher Learning Commission. SNHU is a private, nonprofit school that offers a number of distance learning programs including an online bachelor's of science in criminology. This 120-credit bachelor's in criminology program is ideal for working students who want to gain a comprehensive overview of the social and behavioral sciences behind criminal behavior. The curriculum examines the psychosocial theory behind criminality and the causal factors that influence deviant behavior. Major coursework covers a variety of topics, such as ethics and the criminal justice leaders and international criminal justice. Online courses are offered asynchronously, allowing students to complete coursework at their own pace. All online students at SNHU pay the same tuition rate, regardless of residency. However, U.S. military service members and their spouses can take advantage of a 30% tuition discount. Applicants must have a minimum GPA Of 2.5 to be considered. SNHU is accredited by the New England Association of Schools and Colleges. SMWC is a private Catholic liberal arts school that was founded in 1840 in West Terre Haute, Indiana. The school offers a number of distance learning programs, including an online bachelor's of science in criminology that is offered through the Department of Social and Behavioral Sciences. This 120-credit bachelor’s in criminology stands out for a student-centered approach that is ideal for working students. Graduates are prepared to pursue careers in law enforcement at the local, state, and federal levels. The curriculum includes coursework that emphasizes the social science behind crime and criminal conduct through courses on critical reading, research, and preparation for the practical application of this knowledge. Major coursework covers a variety of topics, including family violence, substance abuse, mental health issues, and oppression. Students may also choose a concentration in psychology or sociology. SMWC is accredited by the Higher Learning Commission. MSU is a four-year public university that was founded in 1905 in Springfield, Missouri. The school offers a variety of distance learning programs including an online bachelor's of science in criminology. This online BS in criminology program emphasizes four areas of the modern criminal justice system: law, police, courts, and corrections. Graduates are prepared to pursue entry-level careers in law enforcement and corrections or to continue their education in graduate school. The 120-credit curriculum includes coursework on a variety of topics, such as geographic and spatial analysis of crime, criminal justice policy, juvenile justice, and life behind bars. Graduates of MSU’s bachelor’s in criminology commonly perform well on the nationally-recognized Major Field Test for Criminal Justice. Applicants must gain admission to MSU and complete 75 credits of coursework before applying to this major. MSU is accredited by the Higher Learning Commission. PSU is a public research university that was founded in 1946 in Portland, Oregon. The school offers a variety of distance learning programs, including an online bachelor's of arts in criminology and criminal justice degree that prepares students to pursue leadership roles in the field. This 120-credit bachelor's of arts in criminology and criminal justice emphasizes the critical thinking and problem solving skills needed to succeed in this industry. The curriculum provides students with a deeper understanding of the social science behind crime and how it impacts communities. All online students pay the same tuition rate, regardless of residency. Applicants must have completed at least 30 credits of transferable college coursework, including a college-level writing course, with a minimum GPA of 2.25 to be considered. The GPA requirements is only 2.0 for those with an associate degree or in the Oregon Transfer Module. PSU is accredited by the Northwest Commission on Colleges and Universities. ISU offers a fully online bachelor's of science in criminology and criminal justice that teaches students both the theory and application of criminology within the modern criminal justice system. This 120-credit bachelor's in criminology and criminal justice program provides students with a solid grounding in the modern criminal justice system, criminal psychology, and their relationship to society as a whole. All students must also participate in internships in criminal justice or a related field. ISU’s faculty are multi-disciplinary experts with doctorates in fields such as criminal justice and psychology. ISU's Department of Criminology and Criminal Justice sponsors a chapter of Lambda Alpha Epsilon, otherwise known as the American Criminal Justice Association. This program is only available for students residing in Canada and the U.S. There are exceptions for U.S. military and State Department personnel and their family members who have APO/FPO addresses. ISU is accredited by the Higher Learning Commission. MSMU is private liberal arts college founded in 1925 in Emmitsburg, Maryland. The school offers a number of distance learning programs, including an online bachelor's of science in criminology program that prepares graduates for careers at the local, state, and federal levels. The 124-credit curriculum takes a broad view of crime and deviance, its role in society, and its effects on both individuals and society. It also takes a critical look at different modes of investigation and the effectiveness of punishment and rehabilitation as compared with treatment outcomes, deterrence, and their societal impacts. Students must maintain a minimum GPA of 2.0 throughout all of their studies at MSMU to graduate. Applicants must submit an online application, one letter of recommendation, all previous college transcripts, and a two page admissions essay to be considered. MSMU is accredited by the Western Association of Schools and Colleges. Coker is private liberal arts college that was founded in 1908 in Hartsville, South Carolina. The school offers several distance learning programs, including a fully online bachelor’s in criminology program that prepares students to pursue entry-level roles in the field or further education in graduate school. This 120-credit criminology bachelor's degree program is ideal for working students. The curriculum includes coursework that investigates the psychology of criminals, the ins and outs of law enforcement, prisons, and parole systems, and the societal consequences of many issues faced in the criminal justice industry. Major coursework stresses the importance of critical thinking skills and lifelong learning, as well as knowing how to recognize, investigate, and analyze patterns in information. Students enroll in coursework on women, gender, race, and class in the context of crime. Coker is accredited by the Southern Association of Colleges and Schools Commission on Colleges. Victimology: Courses in victimology examine the relationship between victims and criminals and explores how victims are treated in the broader criminal justice system. Students learn about a number issues including risk factors, consequences of victimization, non-reporting of crimes, prevention, and victim rights and advocacy. Juvenile Justice: This course examines youth violence, delinquency, and dependency, as well as the relationships that exist between children, adolescents, law, and society. Topics that are discussed include issues such as juvenile justice administration, gangs, drugs, theft, vandalism, and truancy. Psychology of Crime: The psychology of crime combines theory and behavioral science research to explain criminal behavior and interpersonal violence. Topics include psychological disorders, treatment and assessment, punishment and sentencing, the insanity defense, morality and ethics, and forensic assessment. Signifying a commitment to high-quality education, accreditation is an important consideration when applying to online bachelor's programs in criminology. An accredited school voluntarily complies with a set of standards, develops a quality assurance plan, and undergoes repeated financial, retention rate, and job placement reviews. The U.S. Department of Education (ED) determines the scope and criteria used by accreditors, recognizes and approves accreditation agencies, and publishes a list of accreditors and accredited schools. The ED, however, does not individually accredit institutions or programs. Operating in partnership with the ED, the U.S. Council for Higher Education Accreditation (CHEA) oversees a number of accreditation processes in United States, including regional accreditation. Regional accreditation is generally considered the best indicator of academic quality, while national accreditation is typically reserved for vocational or technical programs. Specialized accreditation bodies also exists for particular fields, such as engineering or education. For individuals applying to bachelor's in criminology programs, it's best to choose an accredited school because it means that the institution has been thoroughly vetted. Employers often prefer to hire candidates with degrees from accredited institutions, which is especially useful for the post-graduation job hunt. Accreditation is also important in that it determines your eligibility for federal financial aid. Students who wish to receive federal grants or loans must attend a nationally accredited school. Graduates of online bachelor's in criminology need to put theory into practice, which means finding the right job after graduation. Understanding the causes and consequences of criminal behavior enables budding criminologists to have successful careers in a number of areas including law enforcement, government, public administration, social services, and community planning. Police officers pursue, warn, apprehend, and arrest people who break the law. Duties include responding to calls, patrolling areas, investigating suspicious activity, issuing citations, providing first aid to victims, and writing detailed reports. Law enforcement officers work at the local, state, or federal level. Probation officers and correctional treatment specialists help prevent crime by monitoring and evaluating the behavior of probationers. They help rehabilitate, supervise, and train individuals who are currently in prison or those who have been released. Probation officers must write and maintain detailed files and case reports. Correctional officers oversee individuals who have been arrested and those who are awaiting trial and sentencing. They settle disputes, enforce discipline, and maintain security by searching inmates. During civil and criminal trials, bailiffs maintain order and safety within courtrooms. Substance abuse and behavioral disorder counselors, also known as addiction counselors, help individuals who suffer from drug addiction, alcoholism, and other behavioral problems which may lead to illegal or criminal behavior. By providing treatment and other support, they help improve their clients' personal relationships and overall quality of life. Using stenotype machines and digital recorders, court reporters create word-for-word transcripts of conversations, depositions, and testimonies. They play an important role in the criminal justice system by by creating official records of court proceedings. Students can finance their bachelor of science in criminology in a number of ways, including through loans, grants, and scholarships. Prior to enrollment, students should complete the Free Application for Federal Student Aid (FAFSA) to qualify for federal financial aid and work-study programs. Some need-based scholarships also require students to have completed the FAFSA. Additional scholarships may be available through professional organizations such as the National Law Enforcement and Firefighters Children's Foundation and the National Criminal Justice Honor Society.